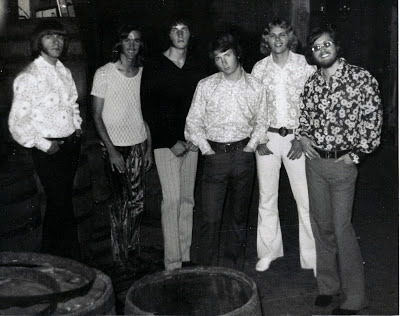 Ric Seaberg's Useful Information/Blog: The Lost Morning Reign Tapes: "A Little Bit of Your Love"
When we of The Morning Reign moved our operation to Seattle in 1969, our goal was to play more gigs. Cac and Shad had both graduated from Willamette University, and Gene and I had both decided that college was not for us. Because Geno and I were more like Rock Star Lead Singer and Guitar Hero, respectively. We dint need no edge yew kay shun. Larry and Steven had joined the band, about a day before we left for Seattle. Though awesome musicians, both of them were younger than the rest of us, still living at home, and uprooting from their bedrooms in their parent’s homes was more of an ordeal than say, it was for me, married with a child. Man we were pumped that the both of them had agreed to come with us. Steve, Larry, and Gene, along with his wife Kathy (Kathy gets a mention in this song) moved into a house on 1st Avenue in Burien, a few miles from downtown Seattle, and that’s where we practiced, in a daylight basement attached to a garage. Cac lived in Burien with his wife, and Doug lived with Donna and I and our baby Stacey, in White Center. All in all, it was a pretty good arrangement. We would all meet everyday at the band house, in Burien, where all the equipment was, practice, choose new songs to learn, wash the truck, and write songs. And we loved to go downtown to visit our booking agent, pick up contracts, and schmooze. At the time we were being represented by General Entertainment Corporation, who had set up shop in a beautifully remodeled old Seattle brick building, one of the first old Seattle downtown buildings to get a complete makeover. It felt like we were in good hands, when we would walk by the refurbished old Seattle brick walls on our way up the stairs to that second floor office, and then, the world’s most charming young booking agent, the handsome and ultra cool John Bauer would meet us, and give us our assignment for the next few weeks. Being in Seattle, just minutes from our agent’s office, helped us get more jobs. We were playing 3 to five nights a week, and even some daytime jobs. Not getting rich, but definitely surviving. This song comes from that period. I like this song because it was a latter day collaborative piece for Geno and I, it’s hooky, and you can pretty much hear that we had become, after the addition of Lare and Steven, musically solid. Steven’s excellent drumming and timekeeping, and Larry’s stellar keys are very apparent. And I don’t want to miss mentioning Doug. Listening back to these old Reign songs, from this recording session especially, makes me feel like Doug may have been a teensy bit under appreciated by us Reignsters. Because the bass parts are rock solid and creative. And I am certain, that when we played this one live, in front of Doug’s drivin’ bass, we were dancin'.